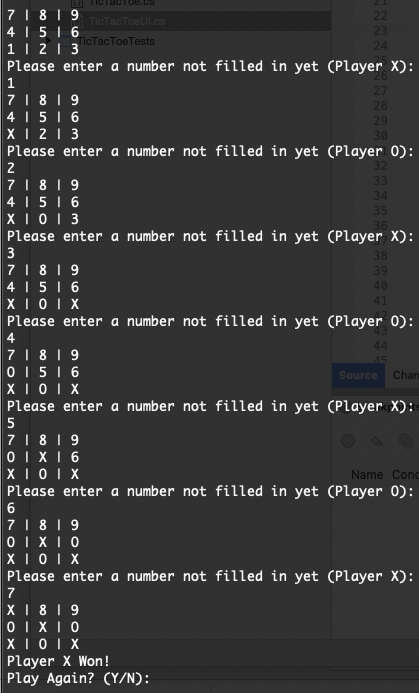 Though I have many years of experience in Java and Ruby, I just got my first experience in building a C# project the other day, a small Tic Tac Toe game. It is a command-line program coded with the new Visual Studio Community for Mac. TicTacToe is the game Model based on IGame interface, which houses all the logic for making moves, checking for win or draw, and maintaining the board status after every move. TicTacToeUI is the Presenter of the game model, sending game output to the View and acting as a controller to process input from the user. While Visual Studio Community for Mac includes some built-in refactoring features, such as class rename, it is definitely inferior to Eclipse, IntelliJ Idea, and IntelliJ RubyMine. It seems ReSharper, a tool offered by IntelliJ's company JetBrains to enhance Visual Studio is a must. I didn't get to toy with it, but I would imagine I'd do so on future C# projects. Overall, I felt well supported by C#'s versatility and not lacking any programming features from Java and Ruby. That has not been my experience with other languages that compare to Java or Ruby. For example, Rust, which I've looked into recently, has a very steep learning curve (albeit quite fun) to writing code that auto-manages its own memory without a garbage collector (Rust's highest selling point and greatest innovation). Also, Perl in its later incarnation seemed to be a clone of Perl-inspired Ruby, providing most of Ruby's features, but with alternative syntax, making me wonder why switch at all. Yet again, that means I get to have the option of consulting for Perl projects if need be (though no sane Rubyist would :P ). The same goes for C# after doing more learning in it. I probably did not exploit every C# feature in the course of writing this mini-project. Comments are welcome, especially that I could be way off in this article due to being new to C#, and would like to be corrected if so.